When Meg of Cookin and Craftin moved from Thailand back to the US, I was secretly really excited to see her make more clothes for her new snowy climate vs. the super heat. 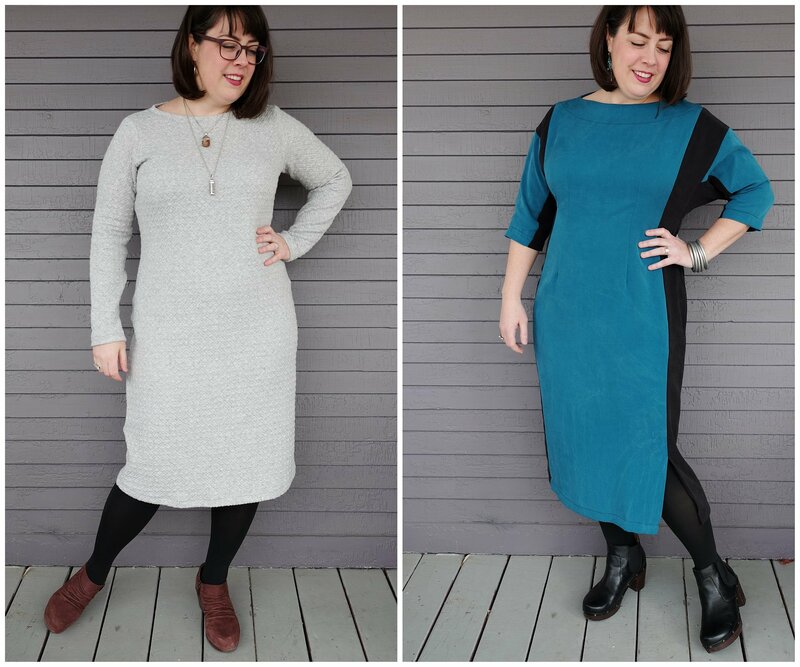 Her dresses for The Day and Night Dress Challenge look like they’d be just perfectly at home in a Vermont winter. Welcome Meg! Hello readers! I’m Meg. 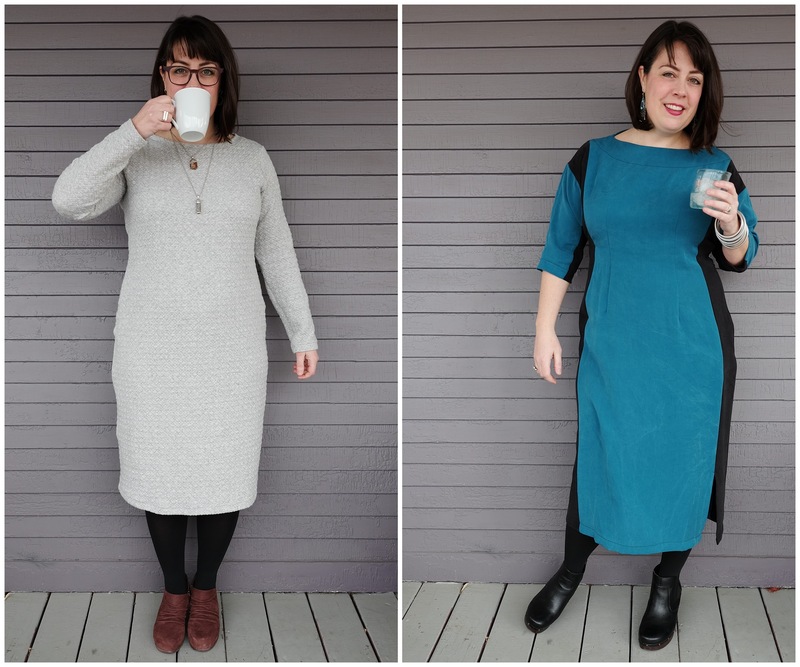 Typically you can find me blogging at Cookin’ and Craftin’ about my sewing projects, but today I’m here to share my Day and Night Dress Challenge projects with you! I agonized a bit over which patterns to make for the challenge. Vermont is a pretty casual place and the messiness of Vermont winters (salt, slush, snow…) necessitate a relatively casual wardrobe. Even when going out for cocktails here, you can (and sometimes must!) do it in a flannel shirt and a beanie. 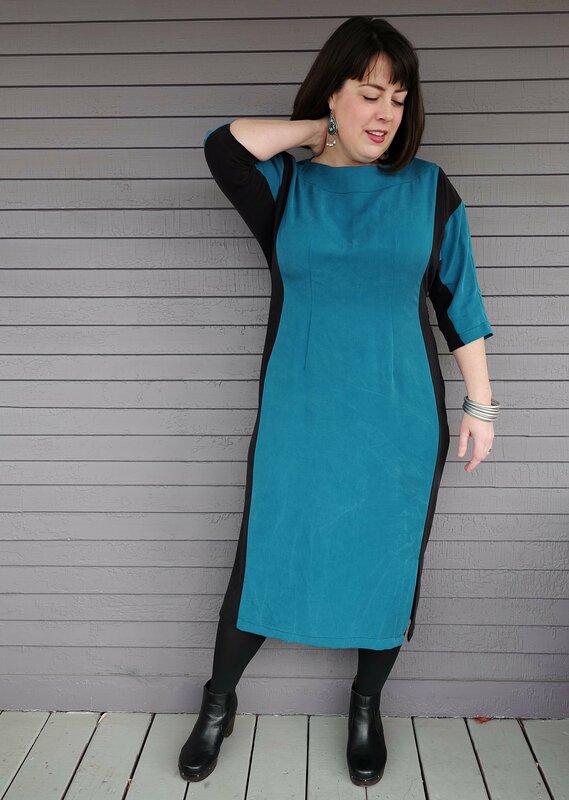 But, practicality aside, the challenge is dresses and I have several dresses on my to-sew list! 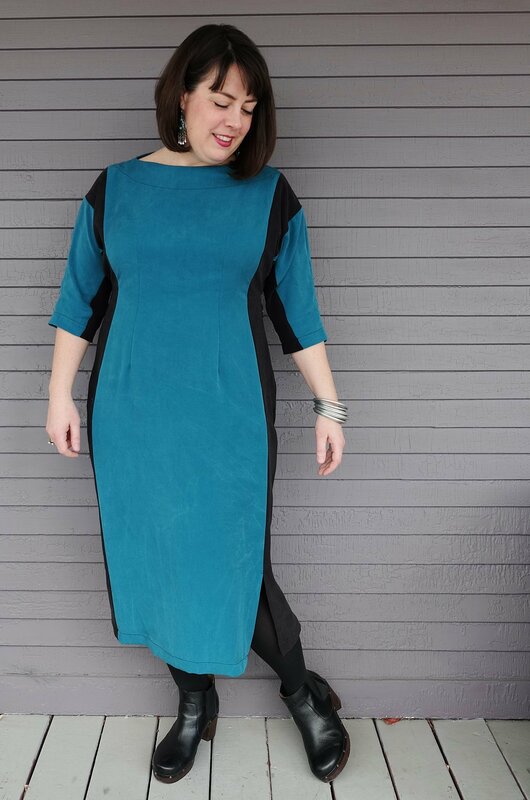 For my cocktail dress, I decided to go for the Named Clothing Agate Pencil Dress, a sleek mid-calf length, batwing sleeved dress, with an opportunity for some cool colorblocking. 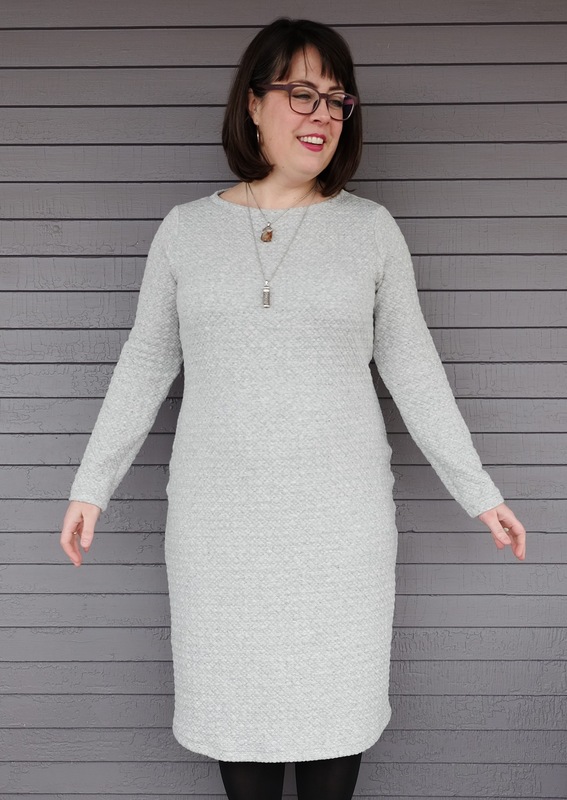 I have had this pattern in my queue since it was released and even purchased fabric to make it last fall. It kept falling by the wayside, though, as I sewed up more sweaters and warm things to suit my new climate. 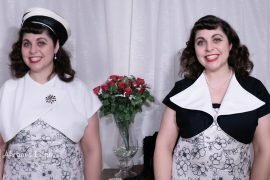 The Day and Night Dress Challenge was the perfect excuse to finally sew this dress! For fabric, I went for two beautiful shades of tencel twill from Style Maker Fabrics: jade for the main bodice and black for the side panels. I didn’t make any fit changes to my size 48 Agate, and lucked out with a pretty fabulous (albeit slim) fit. Love those body skimming darts! I did skip the leg slit’s invisible zipper and the belt. 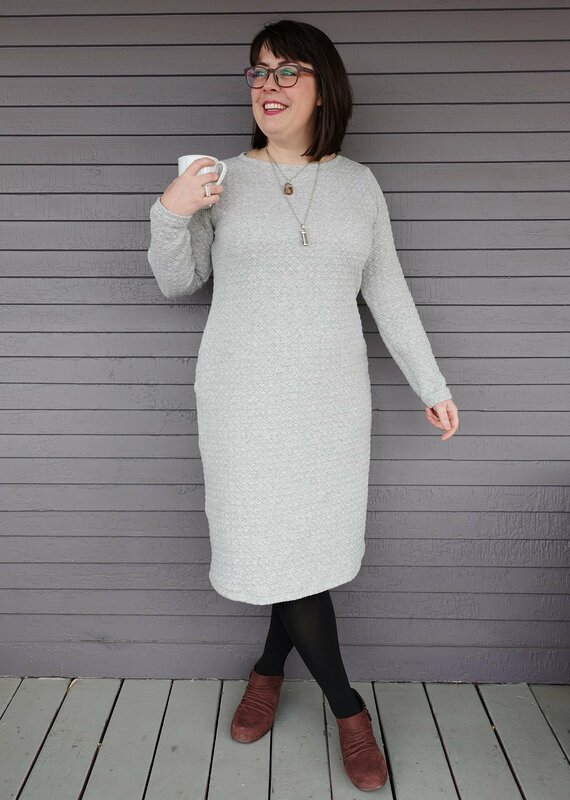 For my coffee dress, I cycled through several pattern and fabric combinations (you can see a previous contender here on Instagram) before making a last minute decision to keep it simple, stupid. I went with an old favorite, the Cashmerette Concord t-shirt (see my Concords here and here and here). It is #Cashmerettechallenge month, after all. I’ve been meaning to make a dress version of this classic curvy t-shirt pattern and I’ve also really wanted a sweatshirt dress! 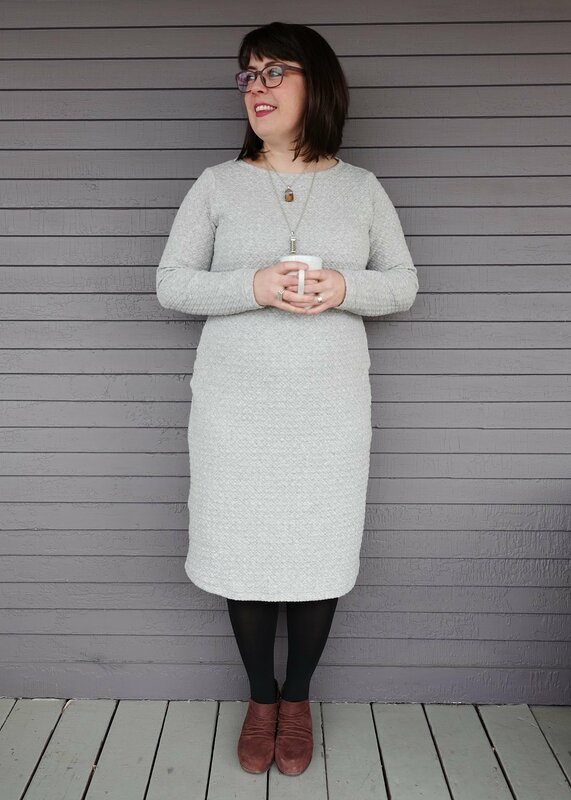 My Concord dress is the high neck option with long sleeves, lengthened 16” at the lengthen/shorten line. Sleeves have an addition 3.25” in length so that I could hem the sleeves by an inch (the pattern has them finished with a band at the cuff). The fabric is this fabulous quilted knit that Joann Fabrics had this past fall- I love this stuff after having sewn it up a few times (here and here). I am so happy with both of my dresses! Thank you to Elizabeth for including me in this fun blog event and to all the other bloggers and vloggers for being so inspiring! I can’t wait to see what everyone makes for the community challenge event, too! It’s sure to be stunning. Loving both of these Meg! Both of your dresses look perfect for some cool weather outings! 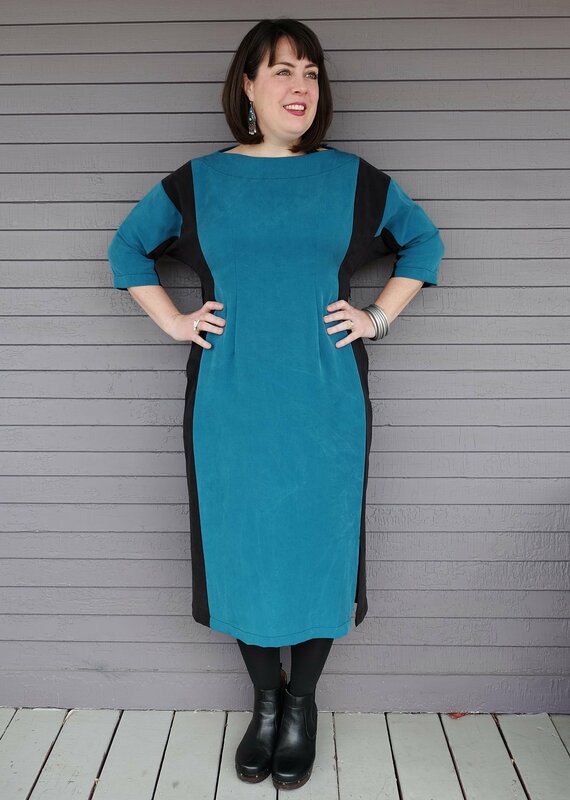 I particularly love the colour-blocked dress – it looks stunning on you. Wow! Both these dresses look great on you! I don’t know which I like better! Gorgeous cosy and perfect for easy drinking and dining. Love the two toned look especially. Both are wonderful, but that Concord Tee dress is just my style. I love both of your dresses, but that Agate is amazing. I’ve also had it in my sewing queue since it came out. I already have two sets of coordinated fabric set aside for it. Seeing it on you really makes me want to clear out everything I’m currently working on and get my first one made! Now that I think about it, I could totally see you in this dress! These colors are so your style as is the colorblocking!